Rhododendron Forests and the panoramic view of Annapurna and Lamjung Mountain. Nepal is the land of extreme rural setting and rural environment as a home to hundreds of indigenous people. The Gurung and Sherpa Community is very famous round the world as Gurkha Soldier and Mountaineer. However, there are more things to know about these people regarding their culture, traditions,lifestyle and festive celebrations. If you are looking to know more about Gurung Community and also wants to get mesmerized by the beauty of Mother Nature including rivers, forests, villages, peaks, mountains and hills then Siklis Trekking is the best trekking route in Nepal for you. 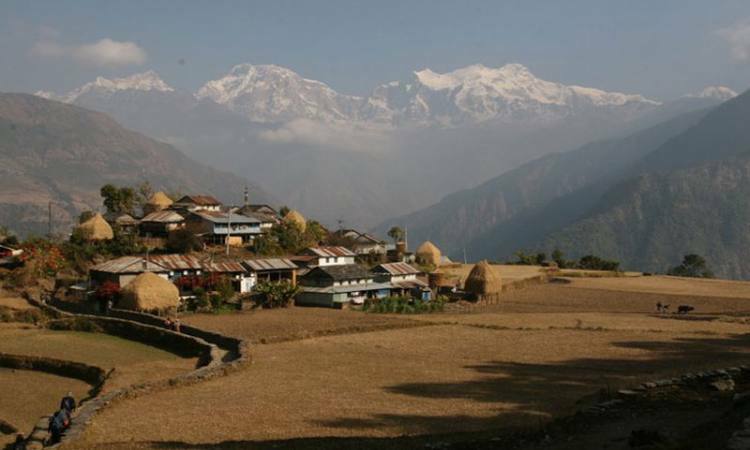 The Siklis Village was first modeled as the ideal Gurung Village under the ACA Project and is supposed to be the second largest Gurung Village in Nepal. The short trek to the Siklis will enthrall you with the sight of Rhododendron Forests and the panoramic view of Annapurna and Lamjung Mountain. There is famous song after this place also in Nepal referring it to the beautiful rhododendron forests.Therefore, trek to Siklis to know more up close about Gurung people’s lifestyle,tradition, culture and festive celebrations. Moreover, you would be amazed to see the cutest amalgamation of the culture and nature. The time spent on this Gurung Village would teach you the life turning lessons. The cloth weaving Gurung ladies to Basket making Gents, the water mill to wooden mill and during the dance to the authentic gurung alcohols there are abundance activities to do in this village residing proudly at the shadow of Mount Annapurna II and Mount Lamjung. Come join the team of Backpacker for the fun in the sun at Siklis where we would witness our trekking becoming a tale which we could share for generations to come. Day 02Drive from Kathmandu to Pokhara The six hours drive from Kathmandu to Pokhara in the selected luxurious vehicle gives you the trailers of things to come in our journey. As we set our journey from the Valley i.e. Kathmandu down along the Trishuli and Marshyangdi river amidst green forests to the Lake city on the lap of Himalayas. The Pokhara City excites you with the ultra urban atmosphere to the natural setting. Day 03From Pokhara to Bijayapu khola - kalikasthanDrive from Pokhara to Bijayapur Khola (Bijayapur military Camp)-Kalikasthan (1370m.) which takes approximately 5 hours. A large trail starts via rice fields close to the army Camp and then ascends via Rakhigaon to a Chautara, a resting area under a massive pipal tree. En course, you may revel in the views in a panorama. Now the paths climb lightly along a ridge pinnacle thru the Brahmin and Chhetri villages toward of Kalikasthan at (1370m.). at the stop, you should climb a short distance to the campsite that's located above the village with panoramic view of mountain, Begnas Tal and Pokhara town. Day 04From Kalikasthan to Lamakhet Trek from Kalikasthan to LamaKhet (1680m. ): which takes approximately six hours. You begin following gently course passing thru neighborhood villages of mixed ethnic socity, rice terraces as much as Mardi Khola. Now the trek is straightforward as you stroll alongside the riverbank. En route you cross Bhaise, Nawaldanda, to attain Lama Khet. it is a small village in where live overnight. This region is surrounded with the aid of inexperienced hills which exhilarates you. Day 05From Lamakhet to SiklisTrek from Lama Khet to Siklis (1,980m. ): and it takes approximately six hours.The path stretches at flat level along the river bank till you reach Khilan Gaon. After this, you observe path which is lightly up at far and steeply up for some hours. En route you bypass Parju village. The path again climbs until Siklis village. it is one of the oldest and huge Gurung village. the majority serve in Indian and British military. Day 06 Rest and explore Siklis village. Rest and explore Siklis village. Day 07Trek down to the valley basin and walk along the Madi river. Day 09back to Kathmandu Drive from Pokhara to Kathmandu in the selected luxurious vehicle gives you the trailers of things to come in our journey. As we set our journey from the Pokhara along the Trishuli and Marshyangdi river amidst green forests. Day 10Departure to final Destination (Farewell)We always feel very sad at this very juncture that our companion of trekking for the moment ends here and in the meantime we also feel relaxed that we were able to serve you with the best trekking experience that you ever get in your lifetime while trekking. We would leave no stone unturned to make your customers feel important and happy. We always take suggestions and encourage our valued customers to promote Nepal and Trekking in Nepal.